Park County commissioners have penned a letter to Yellowstone National Park regarding possible construction on Fishing Bridge. Cody-area business leaders expressed concerns to Yellowstone Superintendent Dan Wenk over the proposed roadwork project around Fishing Bridge. With the summer season heating up in Yellowstone National Park, some officials are sounding the alarm on overcrowding in America’s first national park. A preliminary necropsy has revealed one of Yellowstone’s most rare and famous wolves was shot. 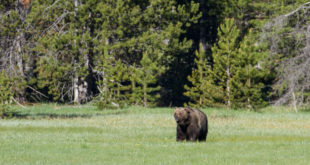 The Interagency Grizzly Bear Study Team (IGBST) will be trapping grizzly bears in the Greater Yellowstone Ecosystem starting this weekend. Yellowstone wolf dynamics could change considerably when Wyoming fully resumes management of wolves outside the park. Superintendent Dan Wenk has promised action in addressing sexual harassment claims in the Yellowstone National Park workforce. A new report from the University of Montana paints a stark picture of overcrowding in national parks like Yellowstone. State and federal officials will spare 25 of the 40 bison originally set aside for the Fort Peck Tribes, according to an Associated Press newsbreak.